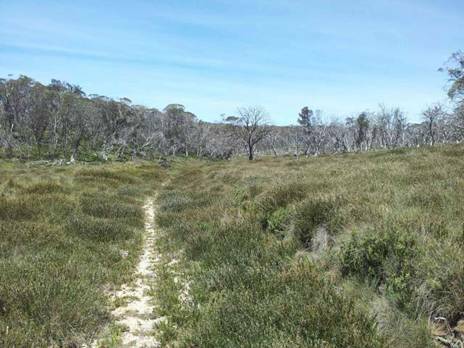 We have many wonderful ‘wilderness areas’ in Victoria, defined by both their remoteness and there not being any tracks or roads in an area of @ 100 square Km. I have been studying my maps. Mt Darling-Snowy Bluff Wilderness, here I come! Several interesting days hiking to come. I think I will walk up the ridge at the Moroka-Wonnangatta Junction (or the Mt Darling Creek junction) to @ Dimmicks (anyway Mount Creek – there is apparently a hut there @ 832705 PS: I did not find this hut), then on to Mt Darling, then walk down the other ridge to the Mt Darling Creek Junction thus circumnavigating (most of) Mt Darling Creek. Very weather dependent though. Along the river bottoms the Wonnangatta-Moroka is about 3-5C warmer than here, but along the tops is probably 10C colder. Then there is the 1” of rain today and half an inch tomorrow…I HOPE this trip doesn’t have to wait until autumn.